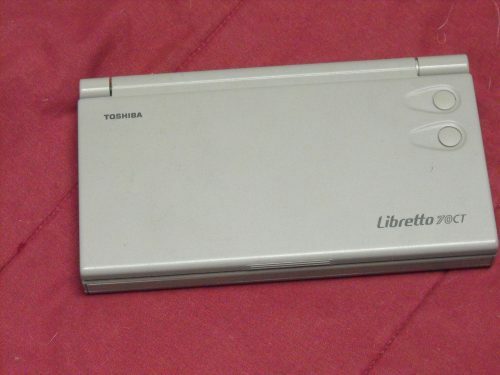 I first picked up a broken one, then I was hooked and had to have a working one. After a couple of weeks of research I was ready to build my portable vintage DOS Gaming machine. I liked playing SimCity 2000, Simtower, Doom, the original GTA and the like. Modern windows does allow most of these games to run, but many without sound (sound blaster emulation not available, etc.) Then I ran across this laptop, which changes all of that. I have repaired hundreds of laptops over the years, and seen or handled probably thousands of them. I have a pretty good mental catalog worked out of what was available with what features, which computer was made crappy, etc. 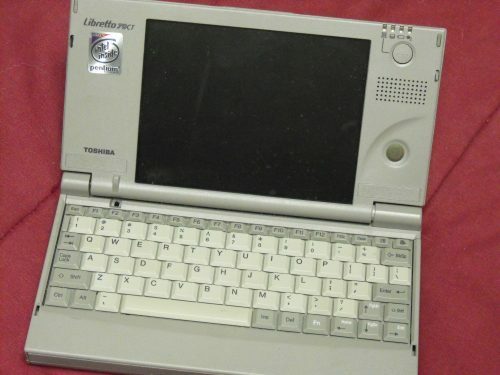 To date the smallest legit laptop that I’ve seen is an Omnibook 800CT, I used to use it every day in high school to connect up to the mainframes that were donated to us in the back room as well as my “MP3 Player”, and a few other things. I really loved the Omnibook and was most certainly one of my favorites. Most people wouldn’t think there is much use for such an old machine today, but they couldn’t be more wrong. I’ve decided it would be great for DOS Games, but I have been using it for a serial terminal on micro controller projects, I’m able to login to my server via SSH and check on things. During the day it has sat on my desk and kept an SSH session open as well as my task list / day planner. Since my phone is currently on the fritz I can use this for most of those personal organizer type needs. I installed windows 95 into my Libretto, I decided that would work best because it’s lightweight on RAM and has MS/DOS Mode. The sound card works a treat, although I had a little trouble at first. As it turns out, if you get the Yamaha generic drivers for the OPL3 there is a sound blaster emulated mode that supports rebooting into MS-DOS mode! Now you can have sound on all your classic games. I still can’t believe it actually fits in a pocket inside my coat. This is a great addition to my computing museum and I’m sure I will have it for many years to come. 8 other peeps rated this an average of 4.9.